The Court of appeal sitting in Ado Ekiti has allowed the appeal filed by the Economic and Financial Crimes Commission against the judgment of Justice Taiwo. O Taiwo of Federal High Court, Ado Ekiti division. Recalled that the upon the judgment of the lower court, the governor withdrew the sum of N5m and transferred the sum of N75n to his lawyer, Mr. Mike Ozekhome SAN. 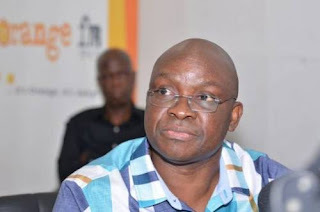 The lead judge to the three-man appeal court panel, Honourable Justice J.S Ikeyegha directed the freezing of the account of Mr. Fayose forthwith.